Kolkata is a huge city with several district articles that contain information about specific sights, restaurants, and accommodation. Not to be confused with Kozhikode, formerly Calicut, a city in southwestern India..
Kolkata (Bengali:কলকাতা) (formerly Calcutta) is the capital of West Bengal and one of the largest urban agglomerations in India. It is the largest city in Eastern India. Kolkata is an 'in your face' city that shocks and charms the unsuspecting visitor. Long known as the cultural capital of India and home to the so-called Bengal Renaissance, 'The City of Joy' (the sobriquet became more famous after the publication of a novel of the same name on the city's struggle against poverty and corruption written by Dominique Lapiere; later made into a Roland Joffe film) continues to spawn generations of poets, writers, film directors and Nobel Prize winners. If your trip only allows for a visit of one or two of India's metropolitan cities, then definitely consider placing Kolkata on your itinerary. Kolkata is arguably one of the most socially, culturally and politically progressive cities in India. Love it or hate it, you definitely won't forget the 'City of Joy'. The colonial district is still the central business and administrative area and is considered the heart of Kolkata. Made up of Esplanade, the northern part of Chowringhee, Park Street, Mirza Ghalib Street (Free School Street), Dalhousie Square (B.B.D. Bag), Chandni Chowk, Barra Bazaar and Sudder Street. The area consisting of the huge park and its surrounding neighborhoods. Includes Fort William, Strand Road, Dufferin Road, Hooghly Bank and the northern part of Chowringhee. The posher part of the city. Covers Ballygunge, Gariahat, Bhawanipur, Alipore, Chetla, New Alipore, Khidderpore, Rash Behari, Park Circus and Entally. The rapidly mushrooming localities to the south of the city. Includes Tollygunge, Behala, Joka, Pailan, Budge Budge, Jadavpur, Garia, Narendrapur and new developments beyond. There are a number of educational institutes in this area. This is a relatively newer part of the city where a lot of expansion is going on. The older area of the city, a fascinating district dominated by narrow little lanes and hundreds of century-old buildings. Includes Chitpur Road, Bagbazar, Belgachhia, Shyam Bazaar, Shova Bazaar, Maniktala, Jorasanko and the College Street area. Also here are the Sealdah station, one of the largest train hubs in India, and the Kolkata station. The large industrial area to the north of the city extends up to Naihati and Barasat. Includes Kashipur, Baranagar, Dakshineswar, Dumdum, Belghoria, Khardah, Panihati, Titagarh, Barrackpore, Madhyamgram, etc. where there are a number of factories, including jute, paper, cotton, ordnance and chemicals. Dum Dum is also the prime communication hub of Kolkata, having the Airport, Metro Rail, Circular Rail, and overground rail in this district. Rapidly developing, especially the IT sector, and home to several malls. Encompasses Salt Lake City (Bidhan Nagar), Chinar Park, Rajarhat, Lake Town and the E.M. Bypass. Many five-star hotels, theme parks, posh housing estates and technology parks are being built in this area. While it is a separate city, Howrah is very much a part of the Kolkata metropolitan area, and Howrah train station is where you will arrive/depart from if connecting with anywhere north, south or west of Kolkata. The Victoria Memorial, a reminder of the Raj. Kolkata's history is intimately related to the British East India Company, which first arrived in 1690, and to British India, of which Calcutta became the capital in 1772. Job Charnock was widely known as the founder of Calcutta (There were 3 villages named Sutanuti, Gobindopur & Kalikata. Later the village Kalikata became the city Kolkata.) but some Indian historians have disputed this claim, arguing that Kolkata developed naturally over a period, centred on the ancient Kali temple at Kalighat and the port at Khidderpore. Whatever its origins, Kolkata flowered as the capital of British India during the 19th century, the heyday of the Raj. Calcutta University, the first modern Indian university was founded here in 1857. Kolkata became the centre of Indian arts and literature, and the national movement for independence got its start here. However, with the transfer of the capital to Delhi in 1911, the pains of the partition of Bengal in 1947, a violent repressive and feudal state machinery operational for nearly the first two decades after independence, the ideologically motivated Maoist movement (the Naxalbari movement) in the 1970s, followed by the Marxist rule has shaped the city to its present form. Kolkata has become the main business, commercial and financial hub of eastern India. The city's economic fortunes grew as the economic liberalisation in India during the early 1990s reached Kolkata during late 1990s. Kolkata is a multicultural and cosmopolitan city, with diversity from all over India as well as Europeans (including Germans, Armenians, and others) and other Asians (including Chinese, Sinhalese, and Tibetans). Kolkata is also notable for being home to India's largest Chinatown, which continues to be home to many ethnic Chinese residents whose families have lived in India for several generations. In 1977, a "Left Front" coalition of the Communist and Marxist parties came to power and ruled the state for 34 years. This is reflected in street names and memorials in the city with names like Lenin Sarani and Ho Chi Minh Sarani. During this period, the various egalitarian approaches implemented at improving the living standards of the down-trodden has helped the city in bridging the wealth-gap and decreasing impoverishment. Kolkata is fast developing into a modern infotech city with various private sector companies setting up shops here. The landscape of the city is also fast changing with flyovers, gardens and several new commercial establishments. Kolkata city itself has expanded into its suburbs, with the Greater Kolkata stretching from Kalyani (in Nadia District) in North to Jaynagar Majilpur in South (in the South 24 Parganas District). The city's fortunes have looked up since the early 1990s, coinciding with the liberalisation of the Indian economy. Its economy has been amongst the fastest growing in the country. The New Metro city is characterised by popular spots such as multiplexes, theatres, clubs, pubs, coffee shops, and museums. Kolkata is home to many industrial units, of large Indian corporations, whose product range is varied and includes engineering products, electronics, electrical equipment, cables, steel, leather, textiles, jewellery, frigates, automobiles, railway coaches and wagons. Several industrial estates like Taratala, Uluberia, Dankuni, Kasba,Howrah are spread throughout the urban agglomeration. A huge leather complex has come up at Bantola. An export processing zone has been set up in Falta. Specialised setups like the country's first Toy Park, and a Gem and Jewellery Park have also been established. Kolkata is also starting to become a major hub for the IT (Information Technology) industry. With the formation of New Town at Rajarhat and extension of Salt Lake's Sector-V, Kolkata is rapidly turning into a pro-IT town. Kolkata is in the eastern part of India and is spread along the banks of the Hooghly river. The Kolkata Municipal Corporation has an area of 185 km². The city can be roughly divided into two sections along Mother Teresa Sarani (which was known during English rule as Park Street). North of Park Street is the more congested part of the city. South of Park Street is the slightly better planned section of the city. South Kolkata is better planned with wider roads and better equipped police force for keeping law & order. The better planning in South Kolkata is because it was built much later. The North is the real, old Kolkata and most of the oldest families and buildings are situated there. Over the past several years the city has expanded to the south and the east. The old Central Business District (CBD) is where the seat of the West Bengal Government is located, along with many other government offices. Several banks have their corporate or regional headquarters around the B.B.D. Bagh area (named after the revolutionaries Binoy, Badol and Dinesh who forced entry into The Writer's Building, the epicentre of the Raj government in West Bengal. Many of Kolkata's older business groups have their main offices here. The area is a mix of multi-storeyed office blocks and colonial buildings. The newer CBD is around the south of Park Street, Camac Street and AJC Bose Road. Several high-rise office blocks including some of Kolkata's tallest commercial buildings, like the Chatterjee International Centre, Tata Centre, Everest House, Industry House, CGO Building, are located here. An even-newer CBD is now being set up in the Rajarhat (Newtown) area, lying between Salt Lake and the Airport. Maidan (meaning open field) is between the river Ganges and J.L.Nehru Road (or Chowringhee). It is said to be the lungs of Kolkata. The lush green meadow also houses Victoria Memorial, Eden Gardens, and several sporting clubs. Kolkatans simply love to stroll in the Maidan. The residential buildings are mainly lowrise and comprise of older colonial buildings and numerous new four-storied apartment blocks. Ten to twelve storied apartment blocks have come up in large numbers in south Kolkata. The city has relaxed its rules on high-rise construction and 20-storey buildings are becoming more common. The tallest residential towers of eastern India, the four 35-storey towers of South City, are on Prince Anwar Shah Road. Heavy construction activity along the Eastern Metropolitan Bypass is changing the face of the city. Luxury hotels, a convention centre, speciality hospitals, condominium complexes, malls and multiplexes are coming up at a rapid pace. The city's expansion in the eastern side is spearheaded by the construction of a large new city called New Town adjacent to the well planned Bidhan Nagar. Located in Rajarhat, it is one of the largest planned urban developments in India. The neglected western side of the urban agglomeration has got a boost with the signing of an agreement with Chiputra, an Indonesian company to build the Kolkata West International City (KWIC). Another huge new township is in the proposal state in Dankuni. Kolkata has three main seasons: Summer, Monsoon, and Winter. Summer, from March–May, is hot and humid with temperatures touching 38-42° Celsius. Monsoon starts in June and lasts till September or October. This is the time when heavy showers sometimes lead to water logging in a few areas. Winter is from November to February. This is the best season to visit the city, as the weather is very pleasant with temperatures ranging between 8 and 20°. Kolkata is in the GMT+5:30 time zone. Kolkata is well connected by rail to almost all the big stations in India and also serves as the gateway to North-Eastern India. Also, there are two international trains from Bangladesh, the Maitree Express connects Kolkata with the capital Dhaka three times per week and the Bandhan Express runs from Khulna once per week. For train timings and tickets check with Indian Railways. 22.58388.34252 Howrah Junction railway station (हावड़ा जंक्शन रेलवे स्टेशन) (Across the Hooghly river from the Esplanade district.). It isn't in Kolkata, but in the adjoining city of Howrah, on the west bank of the Hooghly river. Howrah is the largest railway complex in India with over 600 trains arriving per day. There are 26 platforms in Howrah Station. Local trains of Eastern railway arrives mainly at 1-9 platforms while South Eastern Railway local trains arrive at platforms 17-23, remaining platforms is used for long-distance trains. Platforms 17 to 26 are in New Complex, just south of the original building. For passengers it has an enormous covered waiting area between the main complex and the platforms. In addition there is a Yatri Niwas (railway's travellers' lodge) with dormitory, single room, and double room accommodation. The vehicular carriageways along the length of platforms allow passengers to be dropped near rail compartments — a facility unique among most major stations of the country. Directly facing Howrah are ferries (₹5) that can get you to other side of the river to either Babu Ghat or Fairlie Place in the Esplanade district from where you can arrange onward transportation with anything from taxis to public buses to rickshaws. The Eastern Railway serves local trains to Hasnabad, Bongaon, Gede, Krishnanagar, Budge Budge, Canning, Diamond Harbour, Namkhana, Tarakeswar, Katwa, Bardhaman and numerous intermediate stations and mail/express trains to Central, North and North-East India. The South Eastern Railway serves local trains to Amta, Mecheda, Panskura, Tamluk, Haldia, Kanthi, Medinipur and Kharagpur; and mail/express trains to Central, West and South India. 22.568188.37183 Sealdah Railway station, Bepin Behari Ganguly Street, Sealdah. Handicapped/disabled access. There are 19 platforms. Never hire a taxi from the nearby taxi-stand as they ask higher fares for taxi. There are pre-paid taxis to enter the city. The pre-paid taxi stand just outside the station's main entrance. The counter is under a tin shed. 22.601388.38414 Kolkata Railway station (Kolkata Chitpur Railway Terminus, Bengali: চিতপুর), Belgachi (Buses: K1 ( Kolkata Station -Ultadanga- New Town -unitech) at an interval of about ten minutes; 007 (Makrampur - Kolkata Station via Tematha, Sonarpur Station, Kamalgazi, Garia, Patuli, Hiland Park, Mukundapur, Kalikapur, Ruby Hospital, Science City, Chingrighata, E.M. Bypass, Ultadanga, Khanna, Shyambazar); JM2 (Malancha - Kolkata Station via Harinavi, Rajpur, Kamalgazi, Dhalai Bridge, Patuli, Hiland Park, Mukundapur, Kalikapur, Ruby Hospital, Science City, Chingrighata, E.M. Bypass, Ultadanga, Khanna, Shyambazar) - If you reach near RG Kar Medical College and Hopital, which is only 8 to 10 minutes' walk, you get myriads of buses plying on different routes). It receives a number of trains which used to terminate at Sealdah station. The station is linked to the Sealdah-Ranaghat Line and is served by the Eastern Railway for trains to Bandel, Kalyani Simanta, Gede, Shantipur, Krishnanagar, Dankuni, Kolkata Airport, Bongaon, Hasnabad and others. The number of suburban trains is lower than long-distance trains. This station runs many long distance express trains including two pairs of Garibrath Express, and one long distance passenger train - Lalgola Passenger. 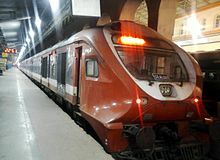 The station also has an International train.The Maitree Express, provides a direct link between Kolkata and Dhaka, the capital of Bangladesh. There are five platforms, among them Platform 1 & 2 is used by only suburban trains, and Platform 3, 4 & 5 are used by long-distance trains. - Services: There are waiting rooms and retiring rooms for use by passengers awaiting connecting trains. In addition there is a taxi stand and a bus station outside the station. 22.583688.28395 Santragachi Railway station, Santragachi Station Rd, Santragachi, Howrah (there are taxi stands and bus stands, and a Volvo bus service to connect this area to Netaji Subhash Chandra International Airport). There are six platforms. Serves local trains to Amta, Mecheda, Panskura, Haldia, Kanthi, Medinipur and Kharagpur. Nowadays, a few trains originate from Santragachi station to Ajmer, Porbandar, Nanded, etc., and a Vivek Express running to Mangalore Central starting from Santragachi. Mostly all Howrah/Shalimar bound express/mail trains stop here. Shalimar Railway station : This is a small railway station (compared to Howrah Station) outside Kolkata which handles a few EMU trains and few Express trains. 22.56488.33846 Eden Gardens Railway Station, Strand Rd, Kolkata-700001 (Pier 'Outram Ghat', 100 m - Babughat Bus Terminus 200 m - Esplanade Metro Station 1.3 km). On the Kolkata Riverview line of the Kolkata Suburban Railway, it provides direct link to Khidderpore, Naihati, Chitpur, Majerhat, etc. It only provides local EMU services. From Bangladesh, there are numerous bus options between Kolkata and Bangladesh. The most common way is the regular comfortable a/c buses from Dhaka to Kolkata via the Haridaspur / Benapole border post. Private bus companies Shohagh, Green Line,Shyamoli [dead link] and others operate daily bus services on this route. Govt. buses run under the label of the state govt. undertaken West Bengal Surface Transport Corporation Limited(WBSTCL) and the Bangladesh Road Transport Corporation (BRTC). WBSTCL and BRTC operate buses from Kolkata every Tuesday, Thursday, and Saturday at 05:30 and 08:30, and 12:30 while from Dhaka they leave on Monday, Wednesday, and Friday at 07:00 and 07:30. The normal journey time is around 12 hours with a one-way fare of ₹550 or 600-800 Bangladeshi taka. If you're only headed to Haridaspur the fare is ₹86 (2.5 hours). The Shyamoli Paribahan ticket office is at 6/1 Marquis St (parallel to and one block south of Sudder Street, and just west of Mirza Ghalib St, next door to DHL), 2252 0693. Several travel agencies around this area also sell tickets for these buses, but at very inflated prices. At the border it's best to change money on the Indian side, but count it carefully and double-check the maths on their calculator. On the Bangladesh side there are some bus stands just behind the border, or you can catch a flat-bed cycle-rickshaw for 5 taka for the 2 km trip to the bus stand for onward travel, or you can walk, but expect the hopeful rickshaw-wallahs to follow you at least half way. From Eastern India via Bangladesh. Bus travel to some points in Eastern India are faster via Bangladesh (visas will be required for entry into Bangladesh as well as for re-entry into India). If you're heading to points in Eastern India (Tripura for example) beyond Bangladesh, then there is a regular bus service between Dhaka and Agartala, capital of India's Tripura state. Two BRTC buses leave daily from Dhaka and connect with the Tripura Road Transport Corporation vehicles, running six days a week with a roundtrip fare of 600 taka. There is only one halt at Ashuganj in Bangladesh during the journey. Call +880 2 8360241 for schedule. Other entry points to North-Eastern India through Bangladesh are Hili, Chilahati / Haldibari and Banglaband border posts through Northern Bangladesh and Tamabil/Dawki border post for a route between Shillong (Meghalaya) and Sylhet in North-Eastern Bangladesh, and some others with lesser known routes from north-eastern Indian regions. Although scheduled bus-services to Shillong/Meghalaya from Kolkata through Dhaka may not be offered at present, it is still possible to get to those points via land routes going through Sylhet and then on to Tamabil/Dawki border outposts. Enquire at the Bus Service Counters for details. Kolkata just wouldn't look the same without the plethora of yellow ambassador taxis that ply on its roads. They're easily available, relatively cheap, and will use their meters, at least in theory. However, Kolkata taxis sometimes refuse to go to some distant remote locations (like Behala, Bansdroni, Howrah) where they wouldn't get any passenger while returning. If they agree, they will demand high pay; be ready for such a situation. New taxis have been introduced, which are called "No Refusal Taxis", but sadly, these taxis are also no different. Some of the new taxis are air-conditioned; usually, these will also have a "Same Fare" sign on them. There is a 25% extra charge if you want the air-conditioner to be turned on in such taxis. In Kolkata, it is a crime for taxis to refuse a request to go to certain destinations, and they can be fined, but if you threaten the driver with a complaint to the police, they will simply ask you to complain. Cars by App-based services such as Uber and Ola are easily available (round-the-clock), reasonably priced, comfortable and have been embraced by citizens. The Kolkata Metro is the oldest metro rail in India. Kolkata's Metro Rail was the first underground rail in India. It is the fastest, cleanest, most reliable, least crowded (though still rather crowded) and most efficient of all the transportation Kolkata has to offer. Trains run every 6-15 min. They run from 07:00-21:45 from Monday to Saturday and 10:00-21:45. on Sunday. Line 1 connects the North and South of the city, from Noapara (Baranagar) to New Garia. Line 2, running from East to West between Salt Lake and Howrah stations, has just been completed, and Line 3 is expected to open in late 2019. New Tourist Smart Cards shall be introduced, Card-I. valid for one day unlimited ride, Card-II. for three days. For more about these, read the conditions here. The electrified suburban rail network of SER and ER is extensive and includes the Circular Rail. Depending on the route, 'local' trains can be extremely crowded. It is less expensive to travel around by train as compared to private cabs or taxis. Men are advised not to sit in ‘Ladies’ compartment. The city has an extensive bus network (possibly the most exhaustive in the whole of India) and this is the cheapest, though not always the most comfortable means of transport. The routes are written all over the colourful buses in Bengali and also in English. The conductors call out their destinations to everyone he's passing and all you have to do is wave at the bus anywhere and it will stop, at times causing a small queue of other cars behind it. Among the buses that ply the city streets, the deluxe buses run by CSTC (Calcutta State Transport Corporation), CTC (Calcutta Tramways Company), JNNURM (Jawaharlal Nehru National Urban Renewal Mission) and WBSTC (West Bengal Surface Transport Corporation) are probably the better option. A/C buses (VOLVO) are also available to many destinations. In Kolkata, there are shared auto-rickshaws i.e. the auto-rickshaws don't ferry just a single person but four person at a time. The fare is not set by meters, as fares are fixed by the auto-rickshaw associations. Auto-rickshaws have a fixed route and a vehicle of that route travel in that particular route only. However unlike taxis, they don't refuse passengers. The fare of an auto-rickshaw is much less than that of a taxi (for example, ₹7-10). Be prepared to give the exact fare as they are very reluctant to give change. There are two types of rickshaws in Kolkata: human pulled rickshaws and cycle-rickshaws. However human-pulled rickshaws are confined to the Gariahat and Ballygunge region and take more fare than cycle-rickshaws. The cycle-rickshaw is the most convenient mean of transport in Kolkata. It is very cheap and can accommodate two adults. The fare is not determined by meter by the respective rickshaw association. Unlike auto-rickshaws, they go to any place in a particular region. However after 22:00 rickshaw drivers may demand an exorbitant fees, and the same goes for times during natural calamities such as heavy rainfall. Being in West Bengal, the native language of the people of Kolkata is Bengali. However, most educated people speak Hindi and English as well. Many shopkeepers and taxi drivers are able to communicate in broken English, and government offices will typically have English-speaking staff on duty. Although it is generally not a problem getting by with English, learning some Bengali will make your trip much smoother. The city sprawls along the eastern bank of the Hooghly River, a branch of the river Ganges, which divides it from Howrah on the western bank. For travelers, the most relevant parts of Kolkata are south of the Howrah Bridge in the areas around BBD Bagh and Chowringhee. A walk along Chowringhee Road sets the pace as you set out to unravel the rare beauty of this city. Across the road sweeps a huge, lush green, open parkland called the Maidan, centering around Fort William, the massive and impregnable British Citadel built in 1773. The fort is still in use and retains its well guarded grandeur. Visitors are allowed in with special permission only. Jawahar Shishu Bhawan (Children Museum), J.L.Nehru Road (Rabindra Sadan Metro Station). Maidan, Maidan. 3 km in length and over 1 km in width, is a rambling green ‘lung of Kolkata’. Dotted with colourful maidan clubs, the area is a hub of diverse activities. Armenian Church, the oldest place of Christian worship in Calcutta. The church of Holy Nazareth was built in 1764.Among the other churches to visit are St Andrew’s Church. The Old Mission Church and the Greek Orthodox Church. Dakshineswar Kali Temple and Belur Math, built in 1847 on the banks of the Hooghly, north of Calcutta, the temple is associated with Shri Ramakrishna, the eclectic 19th century saint who revived Hinduism during the British Raj. Across the river stands Belur Math, headquarters of Ramakrishna Mission. The monastery is a haven of peace and religious harmony. Japanese Buddhist Temple, on the banks of Rabindra Sarovar. Jewish Synagogues, the Maghen David Synagogue on Jewish Synagogue Street and the BETHEL on Pollock Street are very old worship houses and a reminder to the cosmopolitan nature of the city. Kalighat, according to the legend, when Lord Shiva’s wife Parvati’s body was cut up, one of her fingers fell here. Rebuilt in 1809, this is an important shrine of Hindu Shakti worship. The temple is in the southern part of the city. Nakhoda Mosque, modelled on Akbar’s tomb in Sikandra, the red sandstone mosque has two minarets 46 m high, a brightly painted onion shaped dome and can accommodate 10,000 people. Built in 1926 and located on Chitpur Road. Pareshnath Jain Temple, an ornate mass of mirrors, coloured stones and glass mosaic, and overlooks a beautiful garden. It is in Gauri Bari, near Maniktala. Parsi Fire Temples, cater to the religious needs of the prominent Parsi community of Calcutta. Located on Metcalf Street and Beliaghata. Ramakrishna Mission Institute of Culture, commemorates the birth centenary of Shri Ramakrishna Paramahansa. Religious discourses and cultural exchanges are held here among international scholars. The institute is located at Golpark. St John’s Church, built in 1787 with Grecian columns. The burial ground has the mausoleum of Job Charnock, founder of Calcutta. On the north-west side of Raj Bhavan. St Paul’s Cathedral : Constructed between 1839 and 1847 in Gothic style with stained glass windows and two Florentine frescoes, the cathedral is the largest in the city and next to the Birla Planetarium. St Paul’s was conscerated in 1874. Take a walk along the river. There is a good promenade near Eden Garden. Several modern cinemas are dotted around the city, including INOX with several locations, Fame at Metropolis Mall in Highland Park, and RDB Adlabs at RDB Boulevard, Near Infinity Building in Sector 5, Saltlake, all showing Indian and American blockbusters. Nandan, 1/1 AJC Bose Rd (east of Rabindra Sadan metro station), ☎ +91 33 2223 1210. The symbol of art and culture in the city and the site of the Kolkata Film Festival every November. Unlike most of cricket-obsessed India, football (soccer) is the most popular sport in Kolkata, with the local clubs Mohun Bagan Athletic Club and East Bengal Club being the most successful in India. They contest the Kolkata Derby biannually, which is considered by many to be the oldest and most intense football rivalry in Asia. Durga Puja, a festival honouring the Hindu goddess Durga, takes place in October. The biggest festival for Hindus in Bengal and Eastern India, Kolkata takes on an almost carnival like ambiance. Streets shut down for the construction of pandals, large stands that depict events from the Ramayana and crowds flock to the biggest and best ones. A good time to visit, unless you have a fear of crowds. Volunteering is a real option here with several opportunities. Brother Xavier's New Hope. Home for orphans of Kolkata's red light district. A much smaller mission than Mother Teresa's which one man built from the ground up. Brother Xavier and the children always need volunteers and funds. Human Wave, 103, Tentultala Lane,Mankundu, Hooghly, ☎ +91 26 854904, e-mail: tapas.sur@gmail.com. NGO that helps children, women and communities in cities around Kolkata. Visit their website for more info on their 2 weeks to 12 months volunteering opportunities. Mother Teresa's Mission accepts volunteers to help in its multiple projects around the city. Enquire at the motherhouse. Traditionally Kolkata had certain shopping areas or districts. The New Market area was considered the core of fashionable marketing. That was the market place for the British and later patronised by the more sophisticated Indians. There were large markets in Burrabazar, Hatibagan-Shyambazar, Gariahat and Bhawanipur. There were several specialised markets: electrical goods at Chandni Chowk, jewellery at Bow Bazar, books at College Street, fish at Maniktala, flowers at Jagannanth Ghat, the Maidan market for sports goods and so on. The malls are a more recent addition. The South City Mall, supposed to be the biggest in the city, is in Kolkata/Southern fringes. East Kolkata, the area that has come up, has large number of malls. New malls are being added. One has come up at Park Circus, an old neighbourhood in South Kolkata, in 2013. All the district pages list malls and markets in the district. Where there are border-line cases, the mall is listed in one district with a link in the other. Pavu Bhaji is very popular in Kolkata. For ₹20 you get two pieces of toasted bread and a stew of vegetables in ghee. Kolkata has old traditions about eating out. Wilson's Hotel (it later became Great Eastern Hotel) is credited to have been the first western-style hotel/restaurant in Kolkata, serving what was then forbidden food for Indians, particularly Hindus. One could be treated as an out-caste if caught eating there, but the idea caught on and others followed. Many of the restaurants that line the streets in the Esplanade area have been around for more than a hundred years. Bengali food is centred around fish. Macher jhol, fish in curry gravy, is a watery fish curry available everywhere and goes well with rice, but Bengalis everywhere swear by the hilsa fish (a variant of shad). Hilsa, lightly marinaded in mustard and steamed is up there with the best fish dishes in the world. There are a number of restaurants serving Bengali cuisine in all the districts. Bengali sweets are famous all over India. Roshogolla (cheese balls dipped in a sugary syrup), Panthua, a fried variant of the same, Roshomalai, the same cheeseballs dipped in creamy sweetened milk, Mishti Doi (sweet yogurt), Shondhesh (another type of milk-based sweet, available in several variations). Kolkata is also the home of Indian Chinese food. Chinese restaurants are everywhere so try the Indian variant of hot and sour soup and the famous Indian Chinese dish of chilli chicken. The best place to have Chinese is to visit China Town near Tangra: EM Bypass. It serves the best of the Chinese dishes and you will find plenty of large, small & medium restaurants. There are some restaurants serving Thai, Mediterranean or Italian food. Kolkata also has many excellent vegetarian restaurants ranging from budget to expensive ones. There are two types: those serving North Indian and those serving South Indian food. Street vendors selling egg rolls/chicken rolls abound and their freshly prepared kati rolls are safe to eat. Mughali Paratha (earlier it was a paratha stuffed with minced meat, but now the minced meat has been replaced by cheaper but tasty alternatives) is a Kolkata speciality. Fuchka, the Kolkata version of paani-puri, but very different than the ones found in Delhi, is available on the streets but be wary of the tamarind water. It never troubles the local people and outsiders can safely taste this delicacy as long as they don't take too much. Earlier, the restaurants were stand alone entities. A cluster of restaurants in a single mall is a comparatively new idea and has become popular. All pubs are supposed to shut shop by midnight or 01:00. So go early if you want to enjoy in club. Kolkata has long had a concentration of budget backpacker hotels in the Sudder Street area and many of these are colonial era gems, albeit decaying ones. Sudder Street is centrally located and is well connected by public transport. Both the major railway stations at Howrah and Sealdah have many hotels around them. Most of them might be only licensed to accommodate Indian citizens. Be sure to not walk with a local "friend" or guide, unless you want to have higher prices. There are some hotels in Gariahat. Hotels have come up around hospital facilities as for example at Mukundapur and Panchasayar. The growth of the IT Sector in the East Kolkata has lead to development of hotels in that area. Kolkata is the safest metropolitan city in India, and the people are friendly and helpful, unlike in most of India's other large cities. One noted problem is the drug dealers around Sudder Street. However, as the dealers obviously do not want to draw undue attention to their activity, they are not persistent and rarely a threat. There have been rare incidents of chain, bag and mobile snatching in railway stations and empty roads. Places like Watgunge and Garden Reach might not be safe for foreigners and should be avoided at night. The air pollution levels in certain parts of EM Bypass (due to road expansion and construction of elevated Metro railway tracks) has risen in the last few years. Bangladesh, Circus Ave (Just E of AJC Bose Rd), ☎ +91 33 2290 5208, +91 33 2290 5209, fax: +91 33-2288-1616. Issues 15-day visas. Applications are received at window #4 M-F from 09:00-11:00, and visas are generally ready the next afternoon. Bring 3 passport photos. As of December 2018, there seems to be a new policy: the application should be first filled online as directed on their website. You can use the payed services of the stands in front of the High Commission to fill the forms for you, just bring one or two passport photos. Beware that at least in some cases, the Kolkata office can be reluctant to issue visa for non-Indians, and the process requires assertiveness and patience. China, EC-72, Sector I, Salt Lake City, ☎ +91 33 4004 8169, fax: +91 33 4004 8168, e-mail: chinaconsul_kkt@mfa.gov.cn. M-F 10:00-12:30. France, 26 Park Mansions, Park St.
Germany, 1 Hastings Park Rd, Alipore, ☎ +91 33 2479 1141, +91 33 2479 1142, +91 33 2479 2150, fax: +91 33 4004 8168. The origins of the German consulate in Kolkata can be traced to before the existence of Germany itself, to the establishment of the consulate of the Kingdom of Hanover in 1851 and the Consulate of Prussia in 1854. Greece, 10th floor, 21 Camac St, ☎ +91 33-2283 1541, fax: +91 33-2283 1545, e-mail: jalans@vsnl.net. Ireland, 2 Clive Ghat Street, Sagar Estate, 8th floor, ☎ +91 33 2230 4571, fax: +91 33 2248 7669, e-mail: mkj@keventer.com. Italy, Alipore (3, Raja Santosh Road), ☎ +91 33-24792414 - 24792426, fax: +91 33-24793892, e-mail: consolatogenerale.calcutta@esteri.it. Monday-Friday 10:00 -12:00. Japan, 55, M. N. Sen Lane, Tollygunge, ☎ +91 33 2421-1970, fax: +91 33 2421-1971. United Kingdom, 1A Ho Chi Minh Sarani, ☎ +91 33 2288 5173, fax: +91 33 2288-1616. Bangladesh. Tickets for buses running to the border and Dhaka can be reserved at Shyamoli Yatri Paribahan, 6/1 Marquis St (parallel to and one block south of Sudder Street, and just west of Mirza Ghalib St, next door to DHL), ☎ +91 33 2252 0693. 2-3 buses per day leave this office on Tu, Th and Sa, usually at 05:30, 08:30 and 12:30. The fare is ₹86 to the Haridaspur border post (about 2.5 hr). All the way to Dhaka (with a bus change at the border) will cost ₹550 (about 12 hr). Beware that several travel agencies around this area also sell tickets for these buses, but at very inflated prices. At the border it's best to change money on the Indian side, but count it carefully and double-check the maths on their calculator. On the Bangladesh side there are some bus stands just behind the border, or you can catch a flat-bed cycle-rickshaw for Tk5 for the 2 km trip to the bus stand for onward travel, or you can walk, but expect the hopeful rickshaw-wallahs to follow you at least half way. Bhutan - Tucked away in the corner of the bus station is a small Bhutan Government kiosk selling tickets for buses running to the Bhutanese border town of Phuentsholing. Buses depart at 21:00 on Tuesday, Thursday, Saturday and 18 hour journey costs ₹300. Vishnupur - famous for terracotta temples, clay sculptures and silk sarees. Digha - a beach town in the southern part of the state. Buses from Esplanade Bus Station. North Bengal - a mountainous region home to Darjeeling, Lava, and the bustling city of Siliguri, and, further south on the Gangetic plains, the historic districts of Malda and Murshidabad. Samukpota - about 10km from Kolkata is the village of is a "Green Mall," which offers an extensive collection of palm tress plus other plants, gardening tools, yoga instruction, and South Indian food. Santiniketan - famous for the Ashramik School, and university founded by Nobel Laureate poet Rabindranath Tagore. The town is also known for its handmade leather crafts and kantha stitch sarees. Sundarbans National Park - part of the largest littoral mangrove in the world, and home to the famous Bengal Tigers. This city travel guide to Kolkata is a usable article. It has information on how to get there and on restaurants and hotels. An adventurous person could use this article, but please feel free to improve it by editing the page.